Last week, I forgot to put a new bottle of shampoo in the shower for me, so I decided to use the kids’ shampoo, which this week happened to be John & Johnson’s baby shampoo for thick and curly hair (the light blue bottle). BIG MISTAKE……HUGE! 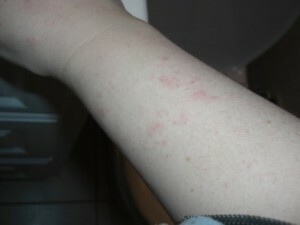 Now, I’ve posted before about my past/present with food allergies, but NEVER in my life have I had a reaction like this. 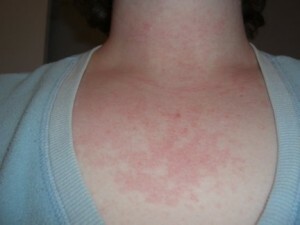 The reaction is concentrated around my neck , chest, back and ears, with spots also on my forearms and the back of my hands. I don’t know why this is the case since the shampoo ran down my whole back when being rinsed off. I hope my new allergist, whom I will be seeing tomorrow will be able to tell me more because I certainly don’t want to use another product with whatever ingredients were in the J&J thick & curly shampoo. And I certainly don’t plan on buying anything else from J&J anytime soon. 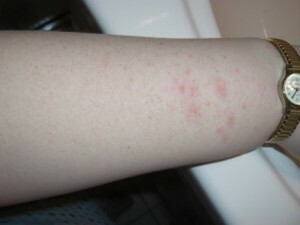 So much for it being dermatologist and allergy tested, which by the way it says in the description of the product. 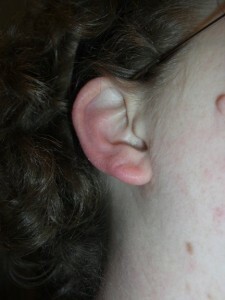 Somehow my left ear seemed to escape any reaction. 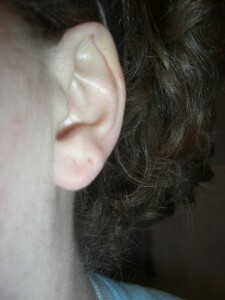 My right ear was not so lucky. Anyone seen Hitch with Will Smith? Yeah, that’s my ear! It feels like someone has a blowtorch on it and is crushing it at the same time. Sleeping on my right side is a real pain…..literally. 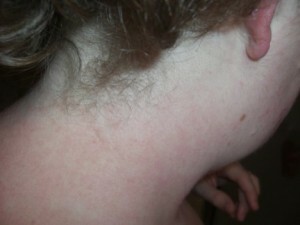 You can also see where it is starting to migrate onto my cheeks. See that angry ear again in this picture??? Needless to say that shampoo went right into the garbage. I get to spend the next two weeks on steroids to make this rash go away and I’m praying that the allergist can tell me anything about this reaction tomorrow because I have no idea what caused it. This post has received 12 comments. 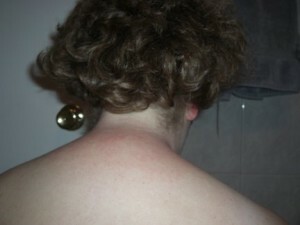 Thanks Johnson & Johnson has been posted in Disasterous Mamamamahoney and Tagged: allergic reaction, allergy to shampoo, curly hair, food allergies, J&J, johnson & johnson, johnson and johnson, johnson's shampoo for thick & curly hair, kid's shampoo, reaction to shampoo, shampoo allergy, shampoo for kids, thick & curly shampoo.